First I want to talk about the Mega Knight’s current work and success. As you can see if you’re interested in what people play, he’s actually having a great success since people unlocked him: He’s used in tournaments and ladder pretty frequently, and has a good winrate which doesn’t seem to go down. He has ~75% winrate in tournaments which is enormous and ~57% in ladder mode which is also pretty good since people play him lvl 1 or 2 for the majority of them. You could tell me that this winrate is not legit because of the MK’s userate. But remember that a LOT of people play this game and 2.1% adoption rate is legit because it still represents a lot of games! Plus, if it was not, the win percentage would change a lot; It doesn’t, and sticks above 70% since the Mega Knight’s entrance. However, the Mega Knight has a lower ladder winrate in Arena 11, where has more good players. I’ll go further into that point in the next part, but we’re at ~53% arena 11 winrate against ~57% overall in ladder mode. My hypothesis about these numbers: The Mega Knight might have this winrate because people are not used to play against him right now. But if that’s the case, it is strange to see that these winrates don’t go down. Ok so, let’s develop what I hinted in the last part: The Mega Knight is hard to counter if you don’t know him or don’t manage your Elixir well. Doesn’t it make you think about an other card? Yes. Sparky. Sparky is a great defensive card which is usually easy to counter when it counter-attacks if you know the card well (Some exceptions can be noted; some people made pretty good Sparky decks which are viable at a high level of play). Sparky is also a great snowball card to destroy an opponent who makes mistakes. Good defense and good counter-attack. The Mega Knight is exactly that! His spawn damages can destroy a whole push combined with his attack damages, which makes him great as a defensive card, but he’s expensive, and has some flaws which make him easy to counter. While he’s easy to counter, he also can punish heavily a single mistake, and is a great tool for counter-attacking with a Hog or a P.E.K.K.A for example. So, how should you play him? You should not use him as a win condition in 1v1 mode, where you’re the only one who can make him hard to stop. He’s pretty expensive so it might be risky to play him with the Golem; The Mega Knight works well with the P.E.K.K.A because they correct each other’s biggest flaw (See below). Being a nice counter-attack card, the Mega Knight would work great with the Hog Rider; also the Miner could be nice to play him with, but it depends even more on the rest of the deck since you will need nice synergies between the Miner and the other cards, as well as between the Mega Knight and the other cards. He does pretty good AoE damages, doesn’t him? It also means your opponents will most likely counter him with tanky units, or surround him when he’s not jumping (Because when he jumps, he does a 360° attack, else he does not). There are many ways to counter a Mega Knight, which means there are many ways to synergies with him too. The Knight is a great example, tanky units will keep the Mega Knight distracted while you kill him with other ones. Typically, a Mega Knight alone can be countered by a Knight and Skeletons. Best counter, however, is the P.E.K.K.A who can take down a Mega Knight by herself. While you distract this guy, flying units will take care of melting his life bar for an easy counter. However, flying units are easy to counter so you should really care about it. Placed at the right moment, and in the right way, swarm units will destroy him. If the Mega Knight is jumping, you want to absolutely avoid using those. If he’s not, surround him and he’ll take a lot of damages. To help you counter this guy, don’t forget that an Ice Spirit will jump before he actually kills it. Also, if he’s badly damaged, Fire Spirits will finish him while he jumps. These are not hard counters but it is useful to know. Because the Mega Knight lacks single damage output, you might be interested in using burst units (Mini P.E.K.K.A, Bandit, Princes..), DPS-heavy (Lumberjack, Elite Barbarians, Minions..) or even classic DPS (Musketeer, Dart Goblin, Night Witch..) units. Those units will give tanky units a hard time countering your Mega Knight. They will synergize with him in case your opponent uses swarm units to counter him. This synergy isn’t as great however, since people will most likely counter him with tanky units. Electro Wizard, Zap etc. 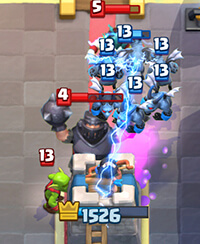 People will sometimes use an Inferno Tower/Dragon to counter your Mega Knight and an Electro Wizard or a Zap can completely change the situation to your advantage. Spells are extremely good paired with the Mega Knight. 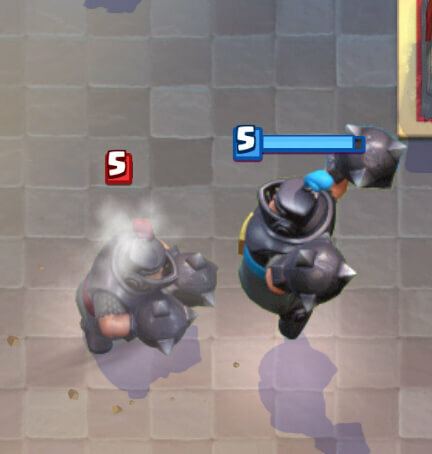 A Freeze spell can completely snowball ( 😀 ) your entire push; a Lightning can kill ranged units who are killing your Mega Knight, like Musketeers and Electro wizards, as well as damaging tanky units like the Knight. A Fireball can destroy a swarm surrounding your Mega Knight, which can be enough for your Mega Knight to jump on the Tower sometimes. The Mega Knight is a nice push enhancer, and will be a great support to some win conditions, making them harder to counter. He can also tank for them, but the nice thing with the Mega Knight is that people will sometimes, as if he was a Sparky, try to counter him and focus on him too much while letting your win condition reach the Tower. You should play cards that will fix his flaws, as seen in the last part ! Defend -> counter attack. Profit from his spawn damages, they are huge. If your opponent counters him too well, you can use him as a tank for your win condition. It is especially great for fragile win conditions like the Hog Rider to reach the Tower. Check what your opponents counter him with : It will help you know how to build your pushes. You can place him in front of your remaining defending units after a successful defense to punish an opponent who used too much Elixir. He’s a great punisher ! Use tanky units to distract him, and swarms to take care of the push and backstab him. Air units are great, but a Horde is expensive : Car about having enough Elixir left to counter him if your opponent has an anti-air spell. If you ever see a lot of them, you should play the P.E.K.K.A : He’s the perfect Mega Knight counter. Manage your Elixir well, because if you spend too much you could be snowballed to death pretty fast. Pressure your opponents to avoid them building a huge push if they play a big win condition with him, like a P.E.K.K.A, or try to stack support units. If your opponent plays an Elixir Pump you might want to deal with it pretty fast, the Mega Knight is extremely violent when your opponent has the lead. If your opponent sees you countering the Mega Knight, he might have a counter to your strategy for the next time : Try to counter him differently. The Mega Knight has a pretty good success right now, and might even be a little too strong. But he’s still a Sparky-like card, which means he’s not that hard to counter. Many things can get rid of him, and pressuring can avoid your opponent building a huge push which would make him unstoppable. Next Clash Royale TROPHY PUSH!? • You Decide My Future!